Stampin' Up! recently published their 250th post on their Corporate Blog, and to celebrate, they have offered Thank You Thursdays each week in October-- a One Day Only Sale on select product(s). Today marks the FINAL Thank You Thursday sale. More specials, promotions, and new products are coming out all the time, and you can Subscribe to My Blog by Email to ensure you get all the news delivered directly to your inbox as soon as I post it! In case you hadn't noticed, Stampin' Up! 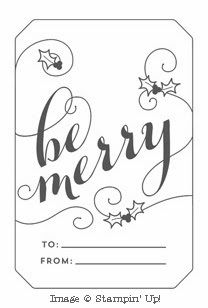 is offering several Single Holiday Stamps this season...among them, the Be Merry stamp holds extra promise in my book! Voila--three, three, three stamps in one! If you want to use them as one single image again, just pop the "to" and "from" section back into the main image before mounting on your clear block. FYI, the Single Holiday Stamps are available in clear-mount only. If you'd like to purchase only one mounting block you can use for this whole stamp (or either of the other two "hacked" images), you'll want to purchase Clear Block E.
Stampin' Up! recently announced another new sales promotion: Weekly Deals, revealed each Tuesday, and running through the next Monday. These sale items have been set aside in limited varying quantities, so even though the sales are running for a week, each product is only available while supplies last. Please note that the Weekly Deal discount will be reflected in your Shopping Bag, not with the item description. Once the sale supplies are exhausted, the item will show up in your Shopping Bag and at Checkout, at the regular price. 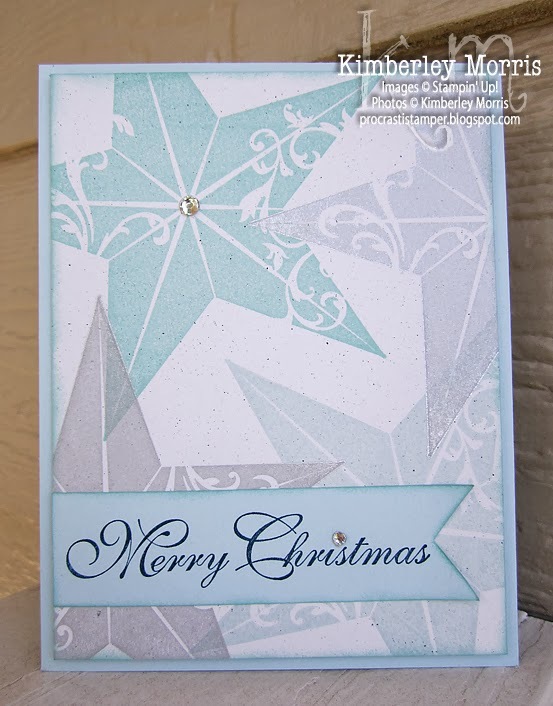 earns you an entry in my FREE STAMPS giveaway, read more HERE! And while you're grabbing supplies at a discount, don't forget to check out our new Pop & Place Holiday Gift Tags and Christmas Tagables stamp set bundles HERE. FREEBIES: Paper supplies to make 6 Thank You Cards! 25% OFF 25 STAMPS special through October 28th! 5) Leave me a comment with your first name and last initial, plus your email address spelled out (i.e., procrastistamper at gmail dot com), confirming each of the above items that you've completed. Your comment might look like this: "This is Kimberley M. and my email is procrastistamper at gmail dot com. 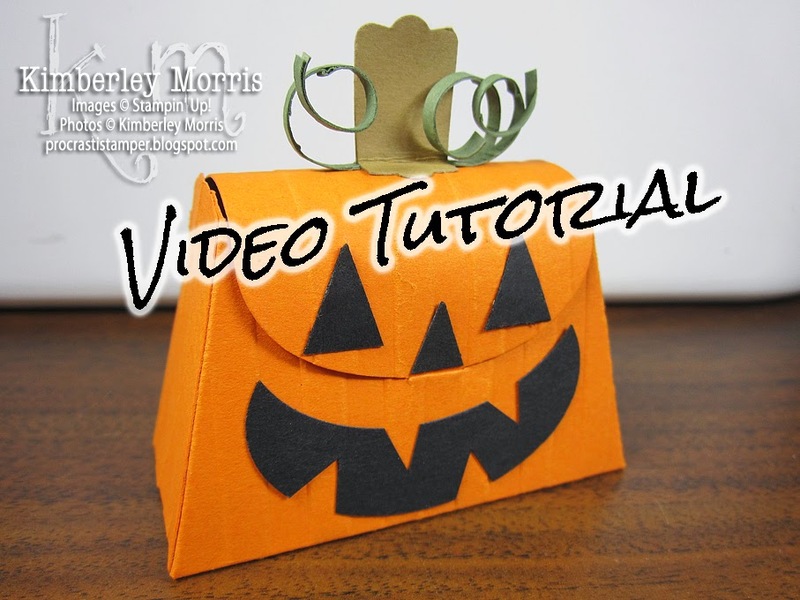 I have already LIKED your FB page, I'm following ALL your Pinterest Boards, I pinned your 10/24/13 Divine™ Jack-o-Lantern Purse Favor Video Tutorial to my Pinterest Halloween board, and I am subscribed to your blog by email." Remember to leave your comment during the appropriate time frame, and include all of the requested info in your comment (and make sure you've done what you've claimed in your comment) or you will be disqualified...and the thought of that makes me so sad!!! And, I'm sorry if this part makes you sad, but these freebies will only be snail mailed to addresses in the US, or APO/FPO. One Faithful Friday Freebie per person during the month, please. I will close & hide the comments after I have picked the winner, so your info won't be hanging out on this blog post forever. Best of luck to you all!!! LAST DAY TO ENTER FOR OVER $150 IN FREE STAMPIN' UP! PRODUCT OF YOUR CHOICE*: Enter the LNS 2013 Fall Treasure Hunt and try your luck!. Get entered NOW, it ends October 25th at 11:59pm PST. *Winners will be chosen from several international Stampin' Up! Markets...$150+ value is valid for a US winner. 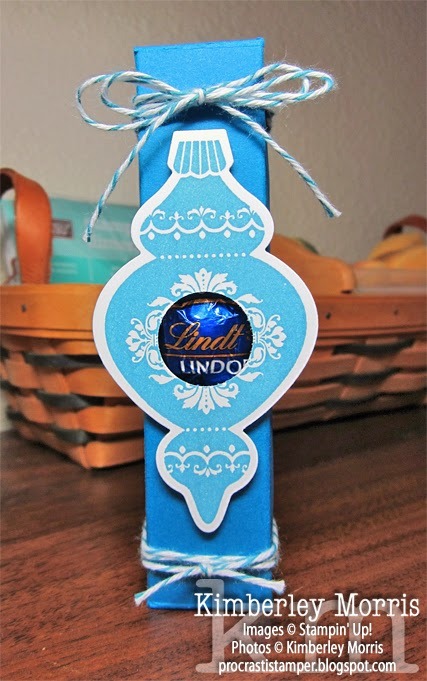 This project was designed to hold Divine™ Milk Chocolate Mini Pieces, or you could substitute Divine™ Dark Chocolate Mini Pieces...the wrapper for those is black, so it adds a bit more coordination! Big Shot Die-Cutting Machine (113439), Premium Crease Pad (113476), Bigz L Petite Purse Die (125606), Stripes Embossing Folder (123128), Pumpkin Pie card stock (105117), Basic Black card stock (121045), Always Artichoke card stock (105119), Baked Brown Sugar card stock(131296), XL Oval Punch (119859), Petite Pennants Punch (122361), Modern Label Punch (119849), Tombow Multipurpose Liquid Adhesive (110755), Paper Snips (103579), Paper Trimmer (126889), Paper Piercing Tool (126189) optional. Stampin' Up! recently published their 250th post on their Corporate Blog, and to celebrate, they will be offering Thank You Thursdays! Each Thursday this month, they will announce a One Day Only Sale on select product(s). [Note: the discounted price will show up in your Shopping Bag and at Checkout] I don't know what these products will be ahead of time, but I will post them on my blog for you when I find out. If you want to make sure you don't miss any, you might want to Subscribe to My Blog by Email. Framelits & Folders--make sure you check out my 25% OFF 25 STAMPS page...some of these items will coordinate beautifully, and you get oodles of savings! Stampin' Up! is celebrating its 25th anniversary all year long, but on the actual date (October 25 to be exact) Stampin' Up! wants to pump up the party even more. Get ready to rock your socks off with a week-long sale on the very products that started it all: rubber stamps! Get 25% OFF 25 Stamp Sets from October 22nd through October 28th at 11:50pm MT. But wait, there's more--at least there is if you purchase your 25% OFF Stamp Sets from ME! For every stamp set listed below that you purchase from my ONLINE STORE, you will get your name entered into a drawing* for another FREE STAMP SET off the list. Yep, the more stamp sets you purchase from this list, the better your chances of winning! Remember, the holidays are coming up, and you can always gift your favorite set or two at a great price, while crossing those crafters off your list, and getting yourself entered to win a FREE STAMP SET of your own. And hey, if you aren't in a position to buy anything right now, but you refer someone new to me and they buy at least one stamp set on the list (and email me to tell me you sent them) during this promotion, then YOU get a FREE entry in the contest!!! That's how much I appreciate your referrals :-D *Drawing will only occur when at least 25 sets have been purchased. LOOKING TO WIN EVEN MORE? 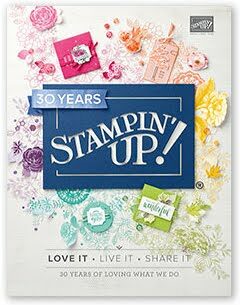 How about over $150* in FREE Stampin' Up! product of your choice in the US?!? Enter the LNS 2013 Fall Treasure Hunt and try your luck!. Hurry and get entered NOW, it ends October 25th. Deadline to Join for $25 has been extended to 11:50pm MT, October 22nd, 2013. **ATTENTION CREATIVE MEMORIES, HERITAGE MAKERS & CLOSE TO MY HEART REPS: In conjunction with this news, Stampin' Up! has made a limited exception to the Competitive Activities Policy for people interested in becoming a demonstrator; anyone who currently is involved in a directly competitive business who signs up between October 21-November 30, 2013 will not need to resign from their former business prior to signing up with Stampin' Up! They will have until December 1, 2013 to decide which company they will represent and by that time will need to resign from one or the other. FREEBIES: Supplies to make 10 of the Ghost Favors you see above, pre-cut and pre-scored, you'll have to decorate and add the candies (two Andes chocolates also fit inside the ghost, side by side). Your comment might look like this: "This is Kimberley M. and my email is procrastistamper at gmail dot com. I have already LIKED your FB page, I'm following ALL your Pinterest Boards, I pinned your 10/16/13 Divine Ghost Favor Tutorial to my Pinterest Halloween board, and I am subscribed to your blog by email." Remember to leave your comment during the appropriate time frame, and include all of the requested info in your comment (and make sure you've done what you've claimed in your comment) or you will be disqualified...and the thought of that makes me so sad!!! And, I'm sorry if this part makes you sad, but these freebies will only be snail mailed to addresses in the US, or APO/FPO. And by the way, I will close & hide the comments after I have picked the winner, so your info won't be hanging out on this blog post forever. Best of luck to you all!!! MORE FREEBIES: How would you feel about winning over $150* in FREE Stampin' Up! product of your choice?!? Enter the LNS 2013 Fall Treasure Hunt and try your luck!. Get entered NOW, it ends October 25th. *Winners will be chosen from several international Stampin' Up! Markets...$150+ value is valid for a US winner. Punches, Punches, Punches! Choose from one (or all 5) of the punches below! I showed you this Divine™ Ghost Favor here in my previous post, and now I've got the pictures posted to walk you through making it yourself. 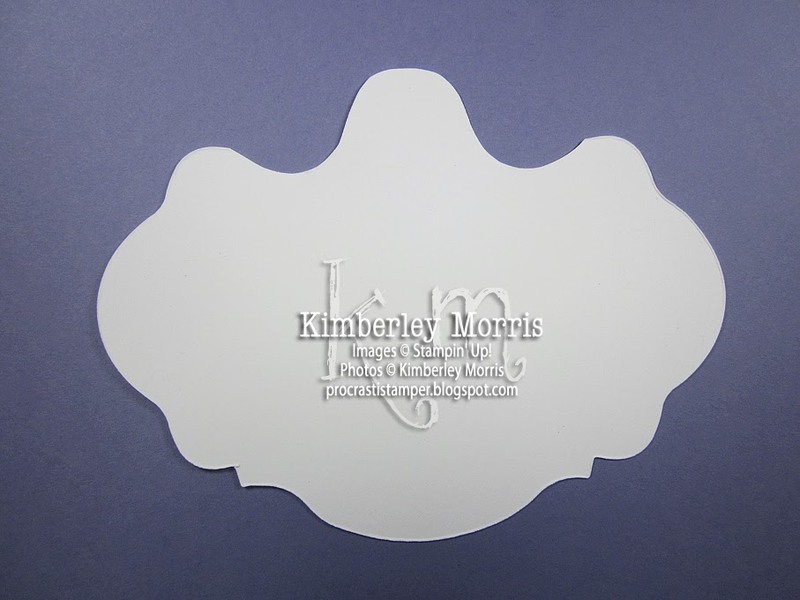 To prepare, you'll need to cut out a shape with the Bigz Clear Oval Accent Die, in Whisper White card stock. 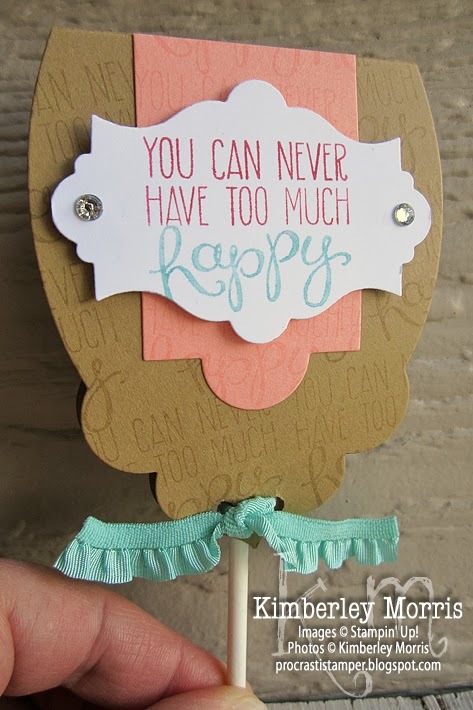 Then, take a scrap piece of card stock and punch through it with the Owl Builder Punch. If you use Basic Black, be sure to keep track of the medium size circle punches from the Owl Punch--you can use those for ghost eyes! 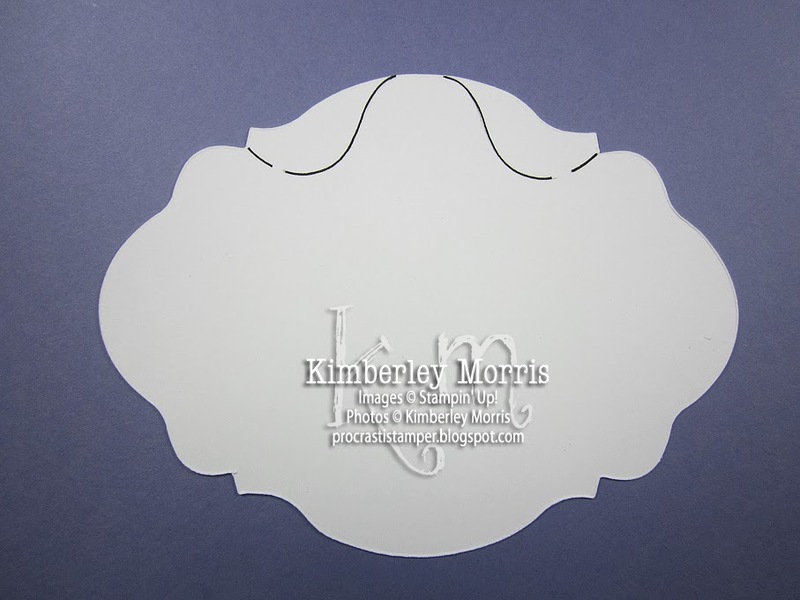 You will then slide the owl template over to the left top part of the oval accent piece, and trace in the same manner...it will be a mirror image of the line on the right side. You will end up with markings on your oval, similar to the marks you see below. You'll want to make yours with light pencil lines so you can erase them. I went over mine in black pen, just to get a good photo. This next step is optional, and you may not need to do it after making this project once or twice, as you will readily "see" the angle after this illustration. In the picture below, I have laid a ruler from the corner of the notch on the lower right part of the oval accent, to the "head" of the ghost. As you can see, this marks a line roughly parallel to the side of the ghost's head. If you need to, you can take a pencil and lightly mark this line for reference. Then, find the same angle on the left side of the oval and mark it lightly. 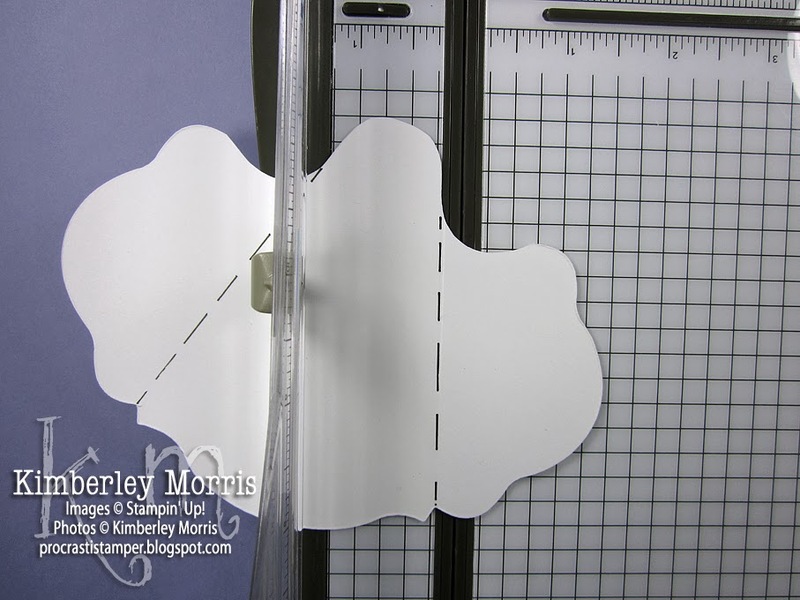 Next, you will see how to line that score mark up with the groove of the Stampin' Trimmer. (again, I made my marks in pen so you could see them on the photos) Make sure the head of the ghost is to the side of that groove at the top, and the notch of the oval is exactly in the middle of that groove at the bottom. Click on this picture if you need to see it full-size, to see the groove clearly. 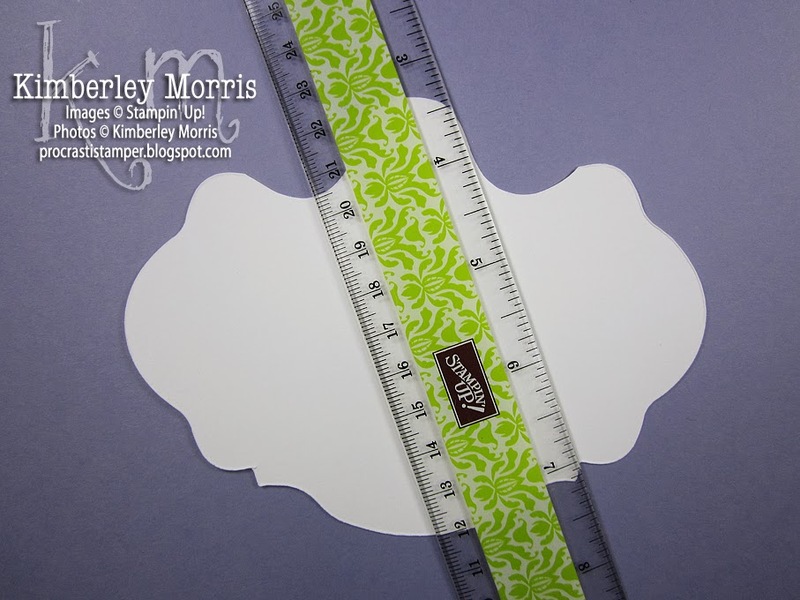 Lay down the guide of the Stampin' Trimmer, and, using the scoring blade, create a score line. Then, turn the ghost 180 degrees and do the same angle on the other side. You will then want to add another score line about 1/4" to the outside of each score line you just made. This will give a little depth to the piece, to help it wrap around the chocolate inside. I simply lined up each of the first score lines I made (which you can see marked in black below) with the outside edge of the brown-grey plastic near the groove of the Stampin' Trimmer. Then, turn the ghost 180 degrees and do the same on the other side. If this method freaks you out, then measure and score 1/4" from the original score marks by lining up the original score marks across the 1/4" line on the Stampin' Trimmer. Either way, make sure the second score lines are farther away from the center on each side of the ghost than the first ones. When you are finished scoring, you will be left with the piece you see below. All that's left to do is decorate it. Our NEW Bite Me photopolymer stamp set includes all the sayings and images you need, to duplicate my sample. Plus, you can see right through the photopolymer of the stamp to see *exactly* where your image is going! 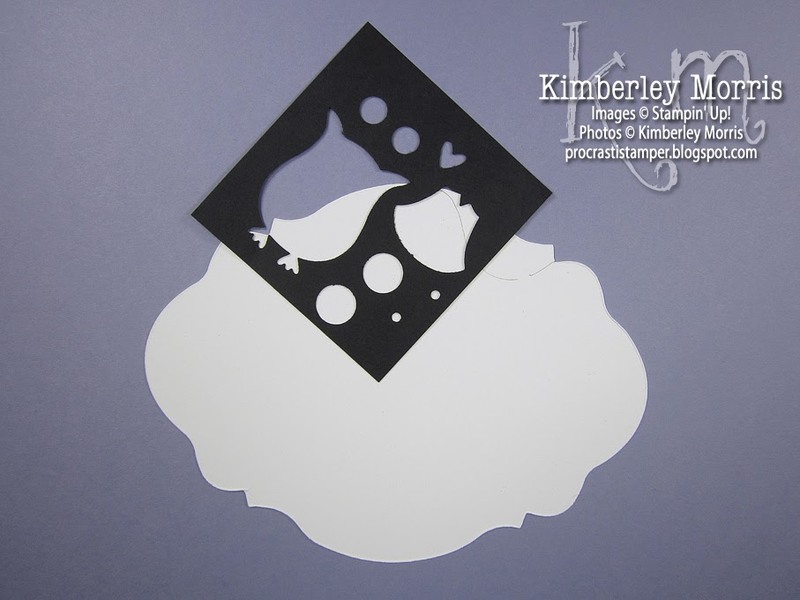 - Make a few of these out of plain copy paper to get the feel of the cuts and angles, and to test out various designs first. - Glue the eyes of the ghost on first. 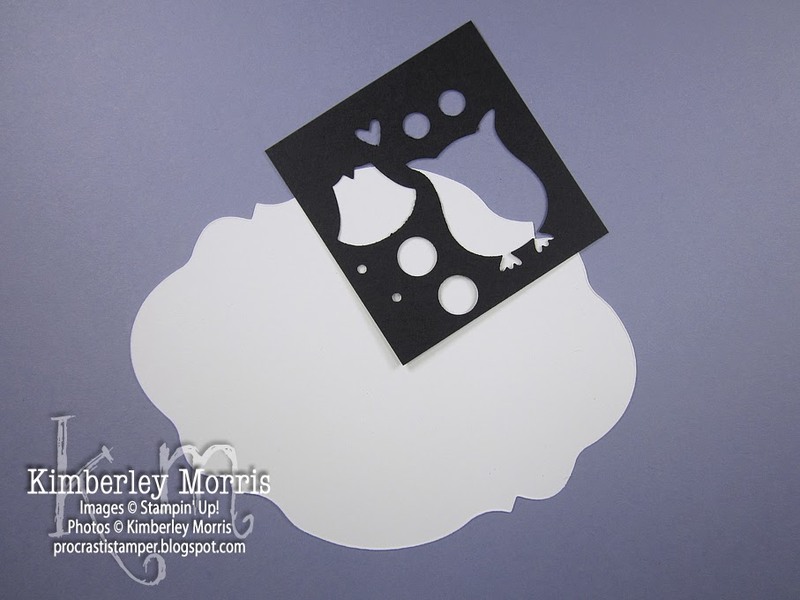 You only need one owl template, so you can stick narrow strips of black card stock into the Owl Builder Punch to punch out only the eyes for subsequent ghosts. You can also just draw on the eyes with a black marker if you aren't into glueing small pieces. - Be careful with your stamped greeting at the bottom, make sure it fits without getting covered up by the ghost's draping "arms" when the piece is closed. Both the Happy Halloween and the Trick or Treat sayings from the Bite Me stamp set will fit perfectly across the bottom, as long as you stamp them as low as they will go across the piece. - Keep your stamping on the inside of the ghost "arms" confined to the outer edges, where they will not show until the favor is opened. 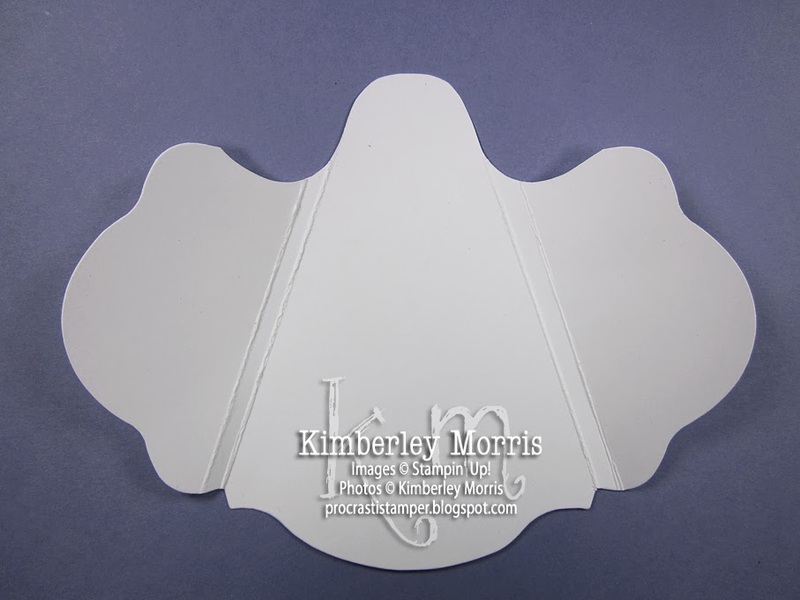 - Sponging the inside and outside edges of the ghost helps the white-on-white features stand out. - You don't have to include a closure piece across the front, but it's much easier to stack, store, and hand these out if they are kept closed. - You can use a punch other than the Ticket Duo Punch for a front closure, if you desire. Remember to only glue down one side permanently, and use a temporary bond for the other side of the punched piece, if you want it to open without ripping. 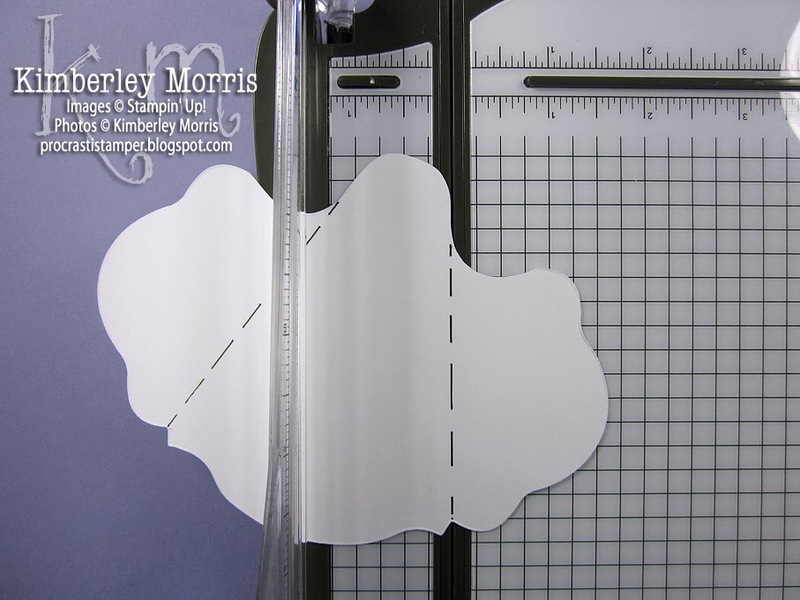 You can find all the supplies I used to create my ghost (except the ruler and the chocolates! ), in my ONLINE STORE. Please check out the item names and numbers at the bottom of my previous post HERE for your shopping convenience.